The Executive Director of Media Rights Agenda (MRA), Mr. Edetaen Ojo, has been elected Convenor of the International Freedom of Expression Exchange (IFEX), the largest network of freedom of expression organizations in the world. As Convenor, he chairs the 13-member IFEX Council, the governing body of the Network elected by the general membership. Mr. Carlos Cortés, Director of the Fundación para la Libertad de Prensa (Foundation for Press Freedom, FLIP) in Bogotá , Colombia , was also elected Deputy Convenor at the General Meeting of IFEX which took place in Oslo , Norway , on June 1 and 2. The meeting took place as part of the Global Forum on Free Expression (GFFE), which brought together more than 500 journalists, free expression activists and writers in a week-long programme scheduled to end on June 6. Mr. Ojo won a seat on the IFEX Council, along with six others members, at the council elections held at the meeting after which the new Council elected him Convenor by a unanimous vote to serve a term of two years. He succeeds Ms Karin Deutsch Karlekar, Managing Editor of the Freedom of the Press Index and Global Internet Freedom Index at Freedom House in New York in the United States , who was first elected as IFEX Convenor in Brussels , Belgium in 2006 and re-elected for another term in Montevideo , Uruguay , in 2007. Besides Mr. Ojo and Mr. Cortés, other members of the new IFEX Council are: Mr. Aidan White, General Secretary of the International Federation of Journalists (IFJ), based in Brussels, Belgium; Ms Aleida Calleja, Deputy President of the World Association of Community Radio Broadcasters (AMARC), who is based in Mexico; Mr. Joel Simon, Executive Director of the Committee to Protect Journalists (CPJ), New York in the United States; Mr. Rohan Jayasekera, Associate Editor of Index on Censorship, London in the United Kingdom; and Ms Barbara Trionfi, Press Freedom Adviser for Asia, Australasia and The Caribbean at the International Press Institute (IPI). Others are Mr. Arnold Amber, President, Board of Directors of Canadian Journalists for Free Expression (CJFE) in Toronto, Canada; Ms Melinda Quintos de Jesus, Executive Director of the Center for Media Freedom and Responsibility (CMFR) in the Philippines; Ms Sihem Bensedrine, Secretary General of Observatoire pour la liberté de presse, d'édition et de création (OLPEC) in Tunisia; Mr. Matai Akauola, Manager and Training Coordinator at the Pacific Islands News Association (PINA) in the Fiji Islands; Mr. Owais Aslam Ali, Secretary General of the Pakistan Press Foundation (PPF) in Karachi, Pakistan; and Mr. Eko Item Maryadi, a member of the Advocacy Division at Aliansi Jurnalis Independen (the Alliance of Independent Journalists, AJI) in Jakarta, Indonesia. 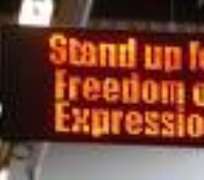 IFEX was formed in 1992 in Montréal , Canada , when leading free expression organisations in the world came together to create a mechanism that would improve cooperation, allow for the rapid exchange of information and facilitate joint campaigns on free expression issues. IFEX now has 88 member organisations operating in more than 50 countries.